Citation Information: J Clin Invest. 2016;126(1):365-376. https://doi.org/10.1172/JCI82755. Osteoarthritis (OA) is the most prevalent and debilitating joint disease, and there are currently no effective disease-modifying treatments available. Multiple risk factors for OA, such as aging, result in progressive damage and loss of articular cartilage. Autonomous circadian clocks have been identified in mouse cartilage, and environmental disruption of circadian rhythms in mice predisposes animals to OA-like damage. However, the contribution of the cartilage clock mechanisms to the maintenance of tissue homeostasis is still unclear. Here, we have shown that expression of the core clock transcription factor BMAL1 is disrupted in human OA cartilage and in aged mouse cartilage. 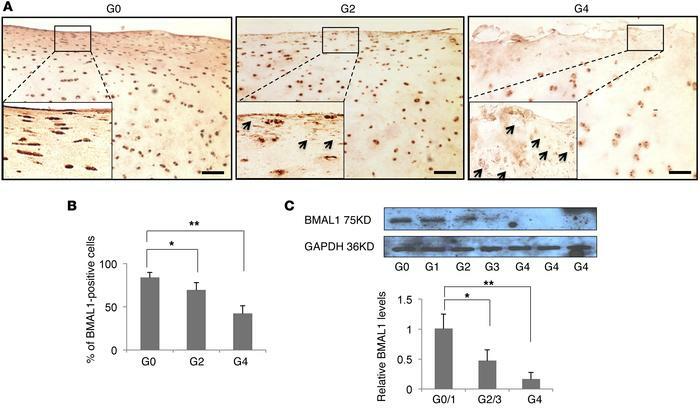 Furthermore, targeted Bmal1 ablation in mouse chondrocytes abolished their circadian rhythm and caused progressive degeneration of articular cartilage. We determined that BMAL1 directs the circadian expression of many genes implicated in cartilage homeostasis, including those involved in catabolic, anabolic, and apoptotic pathways. Loss of BMAL1 reduced the levels of phosphorylated SMAD2/3 (p-SMAD2/3) and NFATC2 and decreased expression of the major matrix-related genes Sox9, Acan, and Col2a1, but increased p-SMAD1/5 levels. Together, these results define a regulatory mechanism that links chondrocyte BMAL1 to the maintenance and repair of cartilage and suggest that circadian rhythm disruption is a risk factor for joint diseases such as OA. Reduction of BMAL1 expression in articular cartilage from human knees with OA. (A) IHC of BMAL1 in full-depth human knee articular cartilage from non-OA (grade 0, G0), grade 2 (G2), or grade 4 (G4) OA samples. Arrows indicate cells with negative or very weak BMAL1 expression. Scale bars: 50 μm. Original magnification, ×3 (insets). (B) Quantification of the percentage of cells that stained positive for BMAL1. *P < 0.05 and **P < 0.01, by nonparametric Mann-Whitney U test. n = 6 individuals per group. (C) Representative Western blot of clinical cartilage samples with various OA scores: grade 0/1, non-OA or mild OA samples (n = 6); grade 2/3, moderate OA samples (n = 6); and grade 4, OA (n = 6). Age range, 45–60 years. For densitometric analysis, the band intensity of BMAL1 was normalized to GAPDH. The average of the G0/1 group was set at 1. *P < 0.05 and **P < 0.01; 2-way significance was calculated by nonparametric Mann-Whitney U test.